Leena shares a reflection about Canada Day, complexity and how the practice of yoga can invite us to lean into bigger questions. This week, life has been inviting me again and again to embrace complexity and paradox. Monday, the local Grand mag azine hit the shelves, with me on the cover. I feel excited and honoured. 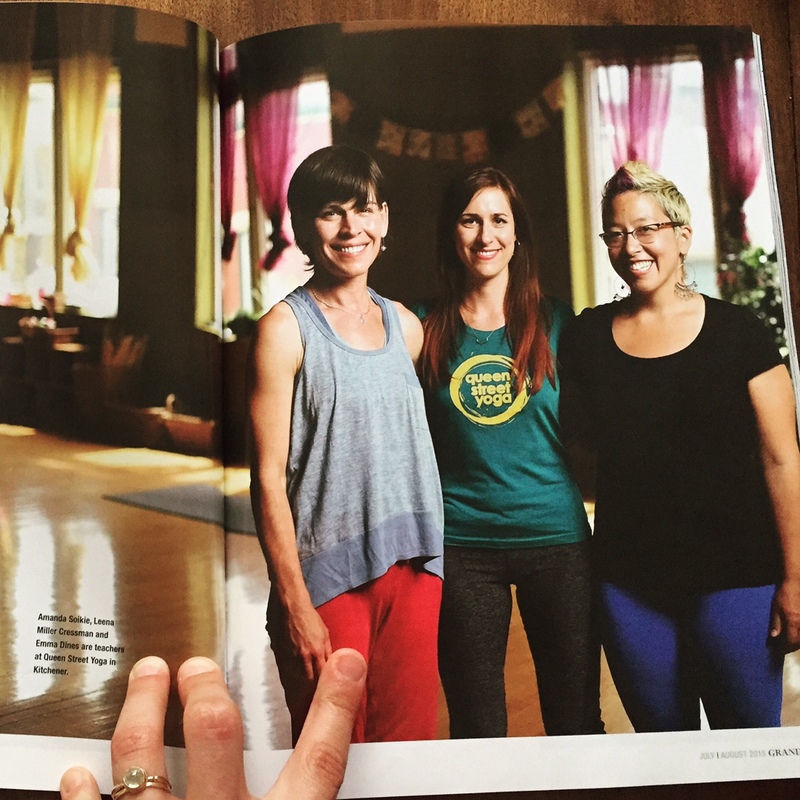 I appreciate the amazing opportunity to tell my story and to share the story of our Queen Street Yoga community. I also feel conflicted. The title of the article is “Yoga for Everyone” and the story speaks to the diversity and inclusivity that we are trying to nurture at QSY. I’m proud of the ways that we’re already doing that, and there’s more work still to do. As I see it, one of the barriers to the yoga community being more inclusive to all genders, races and classes in our community is that similar types of bodies are portraying yoga in the media over and over- in yoga books, magazines, advertisements, etc. If you line up every magazine with someone doing a yoga pose on the cover, I would venture that over 90% of the people portrayed are thin, young, able-bodied, cis-gendered, flexible and female. The vast majority of them are white. Yoga practice invites us to lean into complexity. It invites us to to embrace the paradoxes. It invites us to do one action with our bodies and do an opposing action at the same time, bringing stability to flexibility, letting go but also holding steady. As I stand in a dancer’s pose on the cover of Grand Magazine, I hold the awareness that I fit into all those categories that our culture assumes go with yoga (thinness, whiteness, flexibility, femaleness). 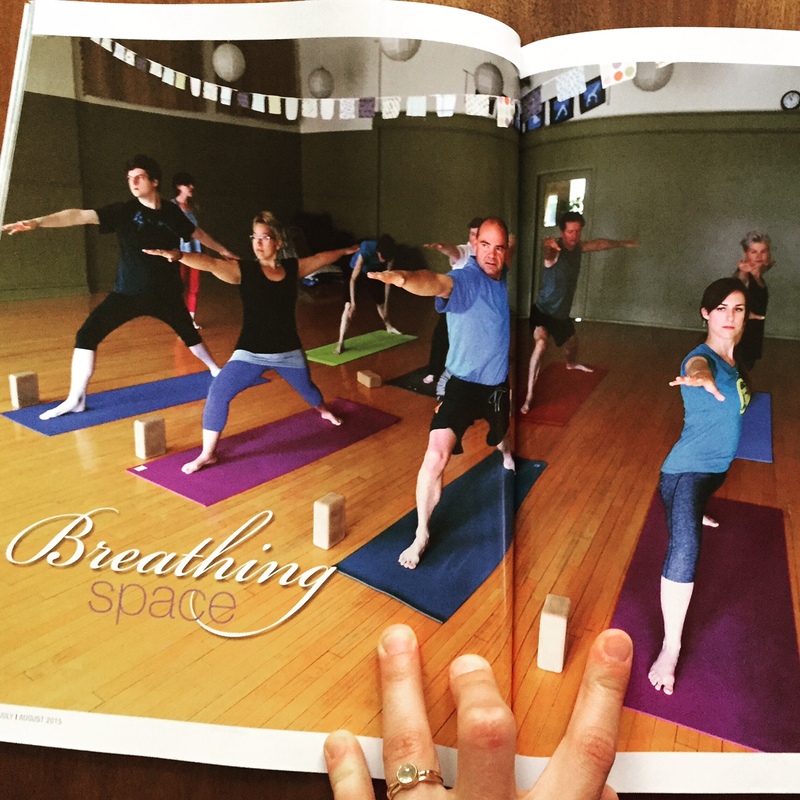 I also celebrate the chance to tell the story of my life’s most precious work: building an inclusive community at Queen Street Yoga. I appreciate the space to share our story, and I’m aware that there are more stories that are equally important that aren’t being told because of the (privileged) space I occupy. 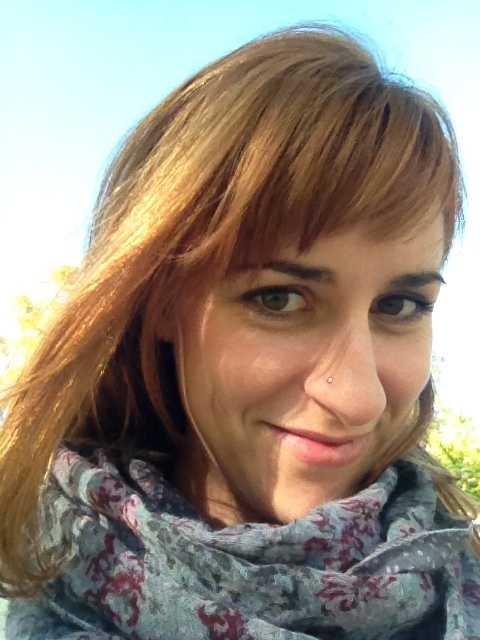 I am conflicted, and my practice says: how can I lean into that more? How can I listen more? What is the most loving action I can take to include even more? Today is Canada Day, and I celebrate a country that is made richer by great diversity of ethnicities, genders, ages, backgrounds. I am grateful to live in a beautiful country where my life is peaceful, where I have clean water and nutritious food, where we have healthcare and infrastructure that takes care of many people. I celebrate all of this while holding the awareness that our history is deeply complicated, and painful for many people. We were not taught how complicated it is in school. We do not like to collectively remember that our colonial past displaced thousands of aboriginal people. We would rather forget that cultural genocide was committed through Canada’s residential school system. I remember that while we have clean drinking water here in KW, there are 116 indigenous communities in Canada without potable and running water. On Canada Day, I appreciate our country and all I have, and I am trying to remember and learn from this history. I remember that there are still huge inequalities in our society. I remember that our Canadian economy is based on profiting from great harm to the environment. I remember that every year thousand of refugees who seek a safe place to live in Canada are turned away at our borders, not so different from my own ancestors who fled here from Russia a century ago. I am conflicted. I am celebrating with joy and I am remembering with sadness. I am baffled by the complexity. My practice says: how can I lean into that more? How can I listen more? What is the most loving action I can take to include even more? This morning, the theme of my class was “It’s Complicated.” Even if I were to teach only about the physical body in teaching yoga, in every instruction and in each class, there is so much knowledge that I have to hold back for lack of time. It’s tricky not to say too much, it’s difficult not to make the class too complicated. Beyond that, I’m aware of how in teaching yoga I can uphold the status quo, or I can do my best to interrupt it and speak another truth to the systems of oppression that exist in our world. I have so much on my heart and mind that I don’t always know how to share. How do I share the complexity I’m thinking of and holding without being preachy or depressing? I want us to also celebrate and enjoy being in our bodies and have fun together while we practice. Because yoga has helped me be more open and a little more able to embrace complexity, I have to try. Our practice says: how can we lean into that more? How can we listen more? What is the most loving action we can take to include even more? I’m going to be deepening my relationship to these questions this August on a Bearing Witness Retreat with the Zen Peacemakers which is taking place on the Lakota First Nation Reserve in South Dakota. I really appreciate the resources and inspiration I’ve gained from their organization in embracing and holding complexity. I bow to all the local and international organizations that are holding these questions and working for greater justice in our world.